I met with Sergei Bodrov Sr. in the Moscow Circus after his film “Prisoner of the Caucuses” was nominated for Nika awards, the Russian version of Oscar. It was a great time. Surrounded by thousands of laughing children dressed in their Sunday best, clowns, and of course, bears, we watched the colorful circus show together; he offered to buy me ice cream. I was on a diet but I ate it anyway. He liked eating ice cream at the circus, he mused. It reminded him of his spectacular childhood running around the circus with the other kids. The show ended. I had promised him an introduction to the bear trainers, as he wanted to talk about bears in movies and how to get them there. And that’s how Sergei and I found ourselves sitting in a somewhat dilapidated dressing room of the, “bear family,” the longtime trainers of the famed, flagship brown bears the Moscow Circus is known for. They’d be doing the bear thing for most of their lives, they said. They were proud of their career. Working with wild animals is one of the hardest genres to master. They said some interesting things that day, like how when they acquire a new bear, they only take on cubs that are taken away from its mother. They bring them into their apartment to live with them and feed them with bottles. This is how the bear gets used to them from the get go. Then at some point, they put them in a cage. The bear trainers become substitute parents. I just wondered where the baby bears went to the bathroom in their living quarters. For the next hour, I sat and said nothing, listening to every question Sergei had for them about what bears can and can’t do on a movie set, who they might or might not attack in the process, and whether or not their young daughter could play the role of the leading actress as the bears know her. (Nope. She didn’t speak English) and wasn’t an actress anyways. Apparently the prospects of a bear on a movie set were dismal. Sergei and I walked away, and lost contact with the bears and each other after that. Here’s when the story starts to get good. Nearly ten years later, in a small town in rural Nevada, I’m in a video store looking for something to rent, and there it is, staring right at me, “The Bear’s Kiss,” his fantasy Romeo and Juliette film that he’d talked about in the dressing room, back in Moscow, years back. Many years back. 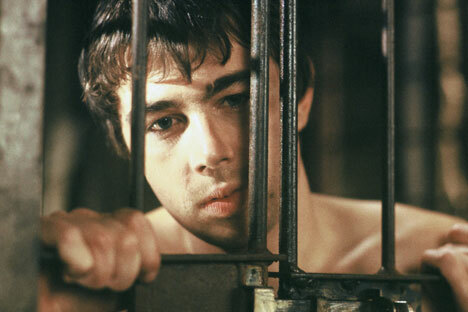 His late son, Sergei Bodrov, Jr., a famed Russian actor popular among Russia’s youth, played the Romeo who changed from a bear to a young man throughout the entire film that seemed to have an awful lot of passionate kissing going on. I watched the film twice. The bear looked so real, it was hard to believe it wasn’t. Could a computer do this? Maybe he did find a real bear somewhere. I like to take some credit for this film. Ok, I know I’m way out of line here, but I like to think that if I didn’t know the bear family, which possibly motivated him to start thinking about this movie, his dream would have never made it to the big screen. The Academy Awards are upon us once again, March 2 to be exact. The bear movie with its unique love triangle won’t be there. It doesn’t mean that he won’t. I’ll be looking for his name again, for even though his former prestigious nominations didn’t lead to an Oscar, as they say, three times a charm.